The way to a man’s heart is through his stomach so, buy yourself a great stove and keep your family healthy and safe. But, which gas stove should you buy? 2 burner, 3 burner or 4 burner or 5 burner? 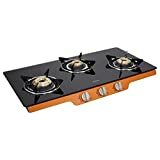 Which is the best quality gas stove in India? Should I buy a glass one, steel or a hobtop one? 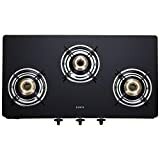 Don’t worry, this Best Gas Stove 2019 – Reviewer’s and Buyers Guide will help you make the right choice. I am a foodie and love cooking! But till now I had been cooking on a very old gas stove given to me by my grandmother. It is made of solid steel with iron burners and was very heavy. I loved it, but it was a 2 burner stove. I needed a 4 burner stove so I could cook dishes quickly when guests came over, or when my kiddo got super hungry!! 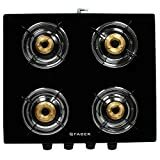 Instead of buying some non branded faulty gas stove from local market, I wanted to be sensible and do some research before choosing one. Let me share with you some of the best gas stoves in India that I found. If you are in a hurry – here are some handpicked options. We highly recommend that you read the entire buyers guide to make an informed and confident choice. What are the types of gas stoves available in India? What are the features that you must look for in the Best Gas Stove? It comes with manual ignition. It is made for bachelors or small families. It has two high efficiency brass burners with the dimensions of 85mm by 85mm. The burners use less LPG and are durable. They are placed perfectly so you can use two large pots at the same time. It is made with brushed matte finish stainless tell base at the bottom and has toughened glass top. It has a drip tray made of stainless steel to bear high temperatures. The burner pan supporters are Euro-coated to avoid chipping. It is easier to clean as the toughened glass is heat and break resistant as well as scratch proof. It comes with 2 years of warranty from Sunflame. It has a shatter proof toughened glass top which makes it easy to wipe and clean it. It comes with 2 tri pin burners which are different in size for to use different sized vessels. It has pan supporters for tandoori cooking. The stove is very compact to help you save a lot of countertop space. Its beautiful black colour adds a class to your kitchen. Prestige provides 2-year warranty for the stove. It is made from stainless tell and has toughened glass on top. It has two thermal efficient tri-pin brass burners. The nozzle on the stove revolves 360 degree. It has a removable stainless-steel drip tray. It comes with a 2-year warranty from Pigeon. It comes with manual gas ignition. It has been tested with High German engineering standards as the glass top is imported from Schott. The valves on the gas stove are imported from Italy which ensures safer cooking and reduced usage of LPG. Each burner is given its own pan support which provides uniformed heating. It comes with 2 years of warranty from Prestige. It has Euro coated pan supports and has a stainless drip tray. The top of the stove is of toughened glass and has a powder coated sheet metal base. The brass burners of the stove are of different sized which makes it easier to use different vessels at the same time. Sunflame gives 2 years warranty on this stove. It’s beautiful black color gives class to your kitchen. It is made of glass and stainless steel so it lasts longer than other stoves. It has rubber legs for greater support and you can has a pan support for Tandoori cooking. It comes with 2 years of warranty and can easily be returned or replaced if you buy it online. The 4 burners on the stove are made of brass. The toughened glass top makes it rust free. It has 360 degree swivel type gas inlet. Eveready gives you 2 years warranty on the stove. 360 degree swivel type gas inlet provided on the back right hand side of the stove. Auto Ignition Gas stove. No need for a lighter. Easy to Clean and Maintain. For LPG Cylinder use. Equipped with 4 Distinct Size Auto Burners; 2 Small, 1 Medium and 1 Jumbo Burner for your varied needs. This gas stove comes with smoothly operated knobs. 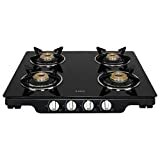 Based on number of burners there are 4 types of gas stoves available in India. 1 burner: Usually one burner stove is apt for bachelors or students as they only need to make tea, maggi, eggs, or quick dishes. People who have very small kitchens can use single burner stove as well. If you need to cook for more than two people then a single burner stove is not too useful. 2 burners: You can find 2 burners stove in most of the houses in India as they are very common and affordable. Most of the kitchens can easily accommodate a 2 burners gas stove. The 2 burners stove mainly comes with two different flame types. One burner is bigger than the other and gives a larger flame then the smaller one which can be turned to a lower flame as per need. 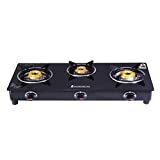 3 burners: A three-burner gas stove is usually in a rectangle shape with two big burners and one small burner in the middle . It is useful for cooking a meal for a family of 3 to 4 people. 4 burners: If you have a large family of more than 6 people then 4 burners stove is the best for you. It saves a lot of time, but uses a little more LPG then the other stoves. Based on burner flames stoves can be sealed or open. Sealed Burners : The sealed burners are covered at the top which controls the flame and the direction of heat therefore reducing the flow of oxygen due to which the flames of a sealed burner are lower in comparison to the open burner. Pros: The best part of the sealed burners is convenient cleaning. The spills remains on top therefore it can be wiped off easily. Sealed burners are popular due to its elegant look. Cons: The sealed burners create less heat due to the covered area. The sealed burners direct heat around the vessel than at the center therefore the heat is uneven compared to open burners. Open Burners: The open burners have an open area around them permitting good oxygen flow which helps in a strong flame. Pros: It is easier and faster to cook food on an open burner as it emits direct heat at the center of the vessel. Cons: Open burners are a little unsafe as the flames are direct and strong. Cleaning can be a hassle with open burners because the spillage goes directly inside the cooking range. Some models also come with a drip tray which can be removed for cleaning. There are two types of ignitions available in India. Both modes are helpful but you have to choose according to the kind of cooking you wish to do. Manual: In the manual mode you light the gas stove yourself with a matchstick or a lighter. If we look into the safety aspect of the stove, the manual mode is a little unsafe as you need to be careful while lighting it. If the match is not lit immediately then you lose gas plus there are chances of accidents. Automatic ignition: Auto ignition mode has now taken over the manual mode as it is much safer. You don’t need to store matchsticks or look for a lighter to use it. All you have to do is turn the knob and with a little spark and batteries the stove lights up. Auto ignition stove is a bit costlier than the manual stove and you might have to get the batteries changed after a while. This can add to your maintenance cost. Budget: Budget is most essential. Always decide on the amount you want to spend on your stove before going to the shop or you may end up spending more than you wanted. Family size: Being a woman, we know how much time it takes to prepare a meal and if you are cooking for a large family then you need more time. If you want to save time in cooking and spend it with your family then go for a 3 or 4 burners stove. If you are cooking for a family of 4 then a 2 burner stove would do just fine. Size of the stove: Size matters most, so before going to shop for a stove make sure you have the measurements of your kitchen countertop. You don’t want to end up buying a large stove and then not use it properly. Looks: Most households have modular kitchens and women are very picky about the colour and designs of the gadgets they want. Same rule applies for your stove. Check to see if your stove looks good on your counter top be it the colour, shape or design. Cleanliness Factor: It all depends on how much time do you have at hand. If you are a working woman and don’t have much time then get a stove is easier to clean like the glass tops, just one wipe and it sparkles. Gone are the days when you only had one kind of stove and didn’t have to choose. Now days there are various kinds of stoves with many features in it. Both types of ignitions manual and automatic are good, it all depends on what you prefer. The manual ignition stove lights up with the help of a match stick or a lighter whereas the auto ignition stove comes with an inbuilt auto ignition which works with the help of a battery. It lights up with one turn of the knob. The auto ignition type is a lot safer as you don’t have to worry about the timing of turning the knob and lighting a match stick. You will find gas stoves with gas pipe inlets mostly on the right side of the stove but there are some which have it on the left. It is important to check if it fits with the setting of your kitchen before buying it. It is crucial to check the size of the gas stove to see if it is suitable for your kitchen counter. You can find stoves with different spacings between the burners. Find one which has enough space between them. This will make it easier for you to use your pressure cooker and kadai at the same time. Make sure the stove you plan to buy is ISI certified and has gone through quality checks. Ensure that the burner knobs are smooth to use. You should not have any difficulty in turning the knobs. All good online websites and stores have a 30 days return policy. So use it wisely. In earlier times the gas stoves were made of brass, aluminium or steel. But now stoves have evolved. You can find gas stoves with shatter proof glass tops, powder coated metal base and spill proof designs. Shatter Proof Glass Tops Stoves: Stoves with shatter proof glass tops are toughened and are made scratch and shatter proof. Pros: They have a smooth surface which makes it easier to clean. Their elegant look and design gives your kitchen a modern look. Cons: The toughened glass is very strong but can break if the temperature changes immediately. The glass shatters if you place overly heated pot on the surface or wipe it with water right after cooking it. Stainless steel gas stoves: Looks are the only thing you will have to compromise on. They are durable and will last a lifetime. Pros: They are easy to maintain. They don’t shatter or break under any circumstances. Cons: They scratch easily and lose their elegance after a while. Remember your mother’s and grandmother’s kitchens. One counter and a simple gas stove sitting on it. But now the kitchens are designed with the best of amenities. You need to find a stove that fits your kitchen’s personality. You can find stoves with glass finish, toughened glass tops with elegant finish etc. They come in different shapes and sized to fit according to your kitchen. LPG prices are hiked every other day therefore you should think of saving on it. Make sure that the burners are emitting even flame and the flames are strong. If it’s not that means it’s using up more LPG than usual. It is best if the stove gives out a blue flame. You don’t want your gas stove moving around with every time you make bhuna masala!! Or just move your spoon in the kadai. It is an open invitation to an accident. Make sure the stove is anti-skid and has rubber padding or some sort of firm platform so you can cook without any hesitation. It is important to have anti-skid stove if you have children that keep wanting to climb up the kitchen counter. Guarantees, there are none so it’s best to look for warranties. If you are buying a branded gas stove, they come with one-year warranty and/or 2 to 5 years of warranty on the burners. If you have fixed a budget for your stove then do some research before buying one. 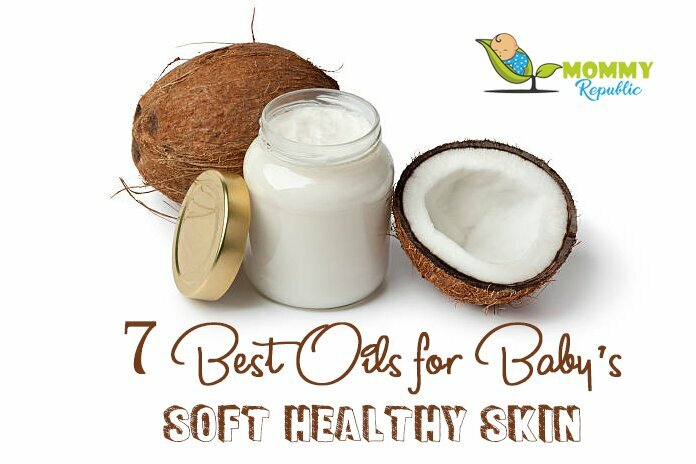 There are good brands available in affordable price. Keep in mind buying a gas stove is a long-term investment and the safety how your home depends on it. Go for durable brands that provide safety and are affordable. The safety how your home depends on it. Go for durable brands that provide safety and are affordable. Gas Stove vs Induction Cooktop – Which is Better? If you use an induction stove then you need to have specific utensils. Whereas you can use any type of utensils on a gas stove. Gas stoves runs on LPG so you are never at a risk of an electric current or a short circuit. You can manage the flame as per your need. You feel comfortable while cooking as you can set the temperature of the flame just by looking at it. You don’t need to assume that the temperature you are cooking at is ok for the dish. You don’t need to worry about the power cuts and delayed meals. Gas stoves are cheaper than the electric or inductions cooktops. Great discounts, you can get a very good bargain during the sales. You don’t have to listen to boring sales pitch, read Amazon reviews and decide. Almost all the shopping sites offer you replacement/refund which you won’t get if you get it from a store. Safety tips to follow when you use a gas stove. Turn the stove off as soon as your cooking is done. Turn the LPG cylinder valve off every time you finish cooking especially at night. Change the rubber pipes that connect your stove with the cylinder every six months. Do not keep plastic bowls or containers near the stove. Don’t allow children to play in the kitchen or touch the stove. Soak the burners, drip trays and pan supports in warm soap water and clean them often. Do not use flammable liquids to clean your stove. Always follow the instructions for installation. If you smell gas, turn the stove and cylinder valve off. Do not light a match or lighter in the kitchen. Open the windows and let fresh air come in. Check and resolve the problem once the gas smell is gone.